The Mount of Olives is one of the holiest places on the earth. It is first mentioned in the Bible over a thousand years before the birth of Christ, in the Second Book of Kings, where one finds described the expulsion of King David from Jerusalem and his withdrawal to the Mount of Olives for prayer (II Kings 15:23, 30-32). It was here also that the Prophet Ezekiel beheld a vision of the cherubim and the glory of the Lord (Ezek. 11:22-23). All four evangelists likewise recount for us the principal events in the Savior's earthly life, all of which are connected with the Mount of Olives. The summit of the Mount, for example, witnessed the prophecy of the final days of Jerusalem (Luke 19), of the Dread Judgment (Matt. 24), the Lord's parting instructions to His disciples, and the foretelling of Peter's denial. The Savior loved the Mount of Olives and spent nights there in prayer. On Holy Thursday, following the Mystical Supper on Mount Sion, the Master and His apostles, "having sung a hymn, went out into the Mount of Olives" (Matt. 26:30). There He promised to meet His disciples in Galilee after His Resurrection (Matt. 26:32; Mark; 14:28). And this, of course, is where He ascended into heaven, as is recounted in the Acts of the Holy Apostles (Acts 1:12). Olivet was also the place where the palace of Herod stood, and where Joanna, the wife of Chuza, buried the precious head of St. John the Baptist after his execution, where it was discovered by the ascetic Innocent in the 4th century, as we read in the Menologion under the date February 24th. It is natural that the Mount of Olives became a place reverently venerated from the very beginnings of Christianity. Under the patronage of the holy Empresses Helena and Eudocia, and of the Emperor Justinian, many magnificent churches were erected on the Mount. Among them was the Church of the Ascension, built by the Empress Helena on the site of the Savior's Ascension. On the feast of the Ascension, many processions would pass from the Holy Sepulcher to this church. Eyewitnesses relate that, on this day, so many lamps were lit on Olivet that the whole mountain appeared to be on fire. It is interesting to note the custom of the time to build churches on Olivet in such a way that the congregation could look above them­selves into the very heavens into which the Savior ascended. In all, there were twenty-four churches on the Mount. The Mount of Olives also became one of the first centers of monasticism in Palestine. The multitude of caves on the Mount were thickly populated with ascetics, a fact eloquently attested in the Lausaic History of Palladius. Here, also, the venerable Melania the Roman founded two convents. All of these monuments of ecclesiastical history were destroyed and rebuilt several times. But after the siege of Jerusalem by Saladin in 1187, the Mount of Olives was given over to sheikhs, who demolished the monasteries and other buildings. Those churches that remained fell into utter desuetude. The area was totally devoid of human habitation until the 1860s, when Christians began to settle on Olivet again. View of Jerusalem from the Mount of Olive. From vol 1, Picturesque Palestine. Here it would be appropriate to recount in brief the story of the Russian pilgrims' attraction to the Holy Land, and the founding of the Russian Ecclesiastical Mission in Jerusalem. "The Holy City of Jerusalem and the Holy Land have attracted the attention of the Russian Orthodox people from the earliest times. The holy Prince Vladimir sent an embassy to the Near East in the year 1001. In 1062, the monk Barlaam of the Monastery of the Caves in Kiev went to the Holy Land on a pilgrimage, and by the 12th century pilgrimages had already reached massive proportions," writes Archpriest Alexander Trubnikov. "From the Russian literature of the period, we know of the 'Travels of Abbot Daniel', who, in the company of a group of pilgrims from various regions of Russia, toured the Holy Land, visiting all the holy sites. Abbot Daniel conversed with monks and princes. As a 'representative of the Russian land,' he was met with respect and attention everywhere he went. From the second half of the 14th century, the record of the monk Stephen of Novgorod has been preserved; from the beginning of the 15th century, the description of Hierodeacon Zosimas of Kiev; and from the 17th century, that of 'poor Basil, surnamed Gogora.' The records of the merchants Tryphon Korobeinikov and Yuri Grekov, who were sent by Tsar Ivan the Terrible to Con­stantinople, Jerusalem, and Antioch to pray for the Tsarevich Ivan, have been also preserved. "The lure of the Holy Land," Archpriest Trubnikov continues, "did not diminish with the passing of the centuries. We have seen that the state policy of the Russian Empire, as soon as it became involved with world affairs, was constantly and persistently concerned with the Christians of the Near East. The activities of imperial policy were an expression of the national concerns of the entire populace of Russia. The Ortho­dox patriarchs of the East were frequently invited to Russia where they were met with honor and were invited to take part in the activities of the Church of Russia. Thus, Patriarch Macarius of Antioch partici­pated in the councils of 1656 and 1666, cooperated in strengthening the reforms of Patriarch Nikon and reassured the clergy who were troubled over the rise of the Schism. A particularly close bond was estab­lished in 1847, when the Most Holy Synod of the Church of Russia sent its Ecclesiastical Mission to the Holy Land, the objectives of which included: representing the Church of Russia before their Holinesses, the patri­archs of the East; championing Orthodoxy; and rendering assistance to pilgrims. "Archimandrite Porphyrius (Uspensky) was appointed chief of the Mission. Other members were Hieromonk Theophan (Govorov),[i] a graduate of the St. Petersburg Theological Academy, who subsequently became Bishop of Vladimir, (later he withdrew to become a recluse in Vysha and is renowned as a relig­ious writer). There were also two clerks. Despite the small size of the Mission's staff and its chronic under-funding (7,000 rubles a year), in five years, up until the outbreak of the Crimean War, it managed to set up an Arabic printing press at the Patriarchate in Jerusalem, which began to issue liturgical books in Arabic. Four pastoral schools were also founded for Arab clergymen—in Jerusalem, Lydda, Ramalla and Jaffa. Finally, the Mission organized the reception of pilgrims. The war terminated the activity of the Mission, but in 1858 a new mission of eleven members, headed by Bishop Cyril (Naumov), arrived to take its place. The budget assigned it was twice that of the previous Mission (14,650 rubles). Bishop Cyril, like his predecessors, was active in a great many fields. Having won the respect of the Turkish administration, the local populace and the Orthodox clergy, he was able to improve significantly the situation and conditions of Russian pil­grims sojourning in the Holy Land. The Mission accomplished much in encouraging many Arab uniates to return to the bosom of the Orthodox Church. "This period saw the birth of an organization later known as 'The Imperial Orthodox Palestine Society'. The society took up donations for the Holy Land throughout Russia. As a result of the Society's activity, more than a million rubles were collected between 1858 and 1864. As it received these funds, the Mission proceeded to purchase plots of land sanctified by one or another event in sacred history, and to build on these parcels hospices for pilgrims, almshouses, hospitals, and other such establishments. In 1864, Bishop Cyril was recalled to Russia. About a year later, he was replaced by Hieromonk Leonid (Kavelin). He was followed in office by Archimandrite Antonin (Kaspustin), previously rector of the embassy church in Con­stantinople, whose role in the history of the Mission is paramount." In 1870, Father Antonin acquired a parcel of land to the southeast of the site of the Ascension of the Savior, on the very summit of the Mount of Olives, which, as Archimandrite Cyprian writes, "was the cause of no little indignation and hostility on the part of the Latin counterparts of our Mission." During the period in question, there appeared in Palestine, under the protection of Emperor Napoleon III of France, an ardent champion of Catholicism, the Comtesse de la Tours d'Auvergne, who selected the Mount of Olives as the center of her activity; there she built a Carmelite convent, in the hope that, with time, she would be able to take over the entire mountain. But thanks to the energy and activity of Fr. Anto­nin, the remaining parcels of land were, one by one, bought up by him from their owners. And now the site is adorned with a spacious Russian convent. The place where according to tradition the precious head of St. John the Baptist was found (the rounded indentation), and ancient mosaics. 1. Beneath the present chapel on the site of the discovery of the precious head of St. John the Baptist, floors were uncovered, replete with mosaics depicting fish, birds, and ornamental designs, sim­ilar to the mosaics at Jerusalem's Monastery of the Cross, and ascribed to the 5th-7th centuries. There was also an inscription mentioning a certain "Jacob, Armenian Bishop of Metspin." 2. In the so-called "residence of the archimandrites," floors decorated with Byzantine-style mosaics, possibly antedating the 6th century, were uncovered. 3. In the residence of the abbots, they found a 5th century mosaic with an inscription mentioning "Theodosius, the most glorious chamberlain." 4. Many burial caves were also discovered, some with mosaic decorations. All of this bore witness to the fact that, in antiquity, the Russian property on the Mount of Olives had been the site of a vast and rich necropolis and a number of churches, Greek and Armenian. The chapel of St. John the Baptist, built over the site of the finding of his precious head. Not far from the site of the discovery of the precious head of St. John the Baptist on the Mount of Olives, there is a stone on which, according to tradition, the Mother of God stood during the Ascension of our Lord Jesus Christ into the heavens. During the excavations conducted by Fr. Antonin near this stone, there was discovered, as he reports, "a fragment of a golden mosaic tessarae and a multitude of small cubes of white marble," as well as the bases of two columns, all dating to the 6th century of the Christian era. Also uncovered was the tomb of a 6th century archdeacon. "Beyond doubt, a church existed here," writes Fr. Antonin, "one of the most ancient churches of Jerusalem. May it someday exist again, with the blessing of Him Who lifted up His hands here and has blessed every good undertaking." Around this ancient church there once existed a Greek convent (possibly one of those founded by St. Melania). During the invasion of the Persian King Chosroes in 614, the city of Jerusalem was destroyed, and we know from history that 1,207 bodies of the slain were found on the Mount of Olives. The convents were also destroyed, and the nuns suffered martyrdom. Traces of their blood are visible to this day as indelible stains on the marble flagstones of the present church. So says tradition. In the same place, on the remains of an ancient Byzantine church, Fr. Antonin decided to construct a temple in honor of the Ascension of the Lord, just as in 1860, fifteen years previously, he had erected a church in Athens on the ruins of the ancient Lykodemus church. Before proceeding with the construction of the church, Fr. Antonin erected on the Mount of Olives a pilgrim hospice, where the Russian pilgrims, who customarily ascended the Mount of Olives after visiting the tomb of St. Lazarus in Bethany, could pause for rest. In this hospice erected by Fr. Antonin, one of the hieromonks of the Mission would greet the pilgrims, vested; he would serve a moleben either in the build­ing or in the open air, and pray for the health of the guests. Afterwards, characteristically Russian hospital­ity was accorded the guests: as much tea and bread as each could want. Those who wished could make donations toward the construction of the church or the support of the travelers' hospice, but such dona­tions were small, the majority consisting of small silver coins or bronze 5-kopek pieces. Having rested a bit and taken a look around, the pilgrims could feast their eyes on the view from the terrace—one of the most beautiful in the world. There one could take in a panorama, which included the eastern portion of the Judean wilderness, the valley of the Jordan, and the Dead Sea. In time, Fr. Antonin began to construct the church. Construction, however, proceeded at a very slow pace, and was repeatedly interrupted. The walls had already risen to a height of nearly seven feet, and the windows had been started when, in 1876, the construction on the church came to an end because of lack of funds. Another reason, as Archimandrite Cyprian (Kern) explains, was the difficulty in procuring various permits (firmans), in finding a way around the Turkish laws, in persuading officials of the court to cooper­ate, etc. The founding of churches and Christian schools during the Turkish period was fraught with par­ticular difficulties. It is said that a certain Salim-Effendi was very well-disposed toward Fr. Antonin. This Mohammedan loved to drink tea, and Fr. Antonin was able to supply him with Russian tea of high quality. Undoubtedly the personal charm of the chief of the Mission overcame many difficulties and made his tasks easier. The Russo-Turkish War of 1877, during which Fr. Antonin had to remove himself to Athens, further delayed construction. Only in 1885, fourteen years after construction had been begun, was the church ready for consecration. It was constructed following the pattern of ancient Byzantine churches, being cruciform and replete with a dome, modeled on that of Hagia Sophia in Constantinople, which sat on an eight-sided drum with twenty-four windows. The iconostasis was imported from Moscow. On the cliroses one can see the remains of two columns from the ancient church. The floor is paved with marble flags in the middle of which are visible fragments of "white marble from one of the most ancient churches of Jerusalem" which Fr. Antonin had discovered. But before the consecration, new difficulties arose. Nicodemus, the Greek Patriarch of Jerusalem, lodged a complaint in St. Petersburg against the "great scandal" supposedly caused by Fr. Antonin when he decided to name his new structure the "Church of the Ascension," whereas the site of the Ascension is not situated on Russian property. On the basis of this protest, Fr. Antonin had to rename the church on the Mount of Olives the "Church of the Savior," in an attempt to resolve the conflict. Later the church would become known as that of "the Savior's Ascension." At the present time, its original appellation has been restored. At the same time as the church, a four-tiered, 210-foot high bell-tower was erected. It was designed by Italian architects, and was also built at a very slow pace. As often as his work would permit him, Fr. Antonin would visit the Mount of Olives; and even when he was occupied with other matters, he would observe the construction from the corner window of his residence at the Mission with the aid of a telescope. When construction was completed on the bell-tower, the main bell arrived by steamship at Jaffa. It weighed 11,123 pounds, and measured nearly seven feet in diameter. It had been donated by a close friend of Fr. Antonin, A. B. Riazantsev, a merchant of Solikamsk. In August of 1885 this bell, thanks to funds provided by Countess O. E. Putiatina, was conveyed from the wharf to the Russian garden in Jaffa, near the tomb of St. Tabitha. 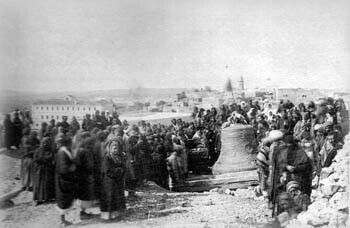 Pilgrims moving the bell from Jaffa to the Mount of Olives. The problem of moving it to the Mount of Olives remained. Fr. Antonin then issued a call to the Russian people: "Are there no loving Christians who will help raise Jerusalem's 'Ivan Veliky'[i] to the Mount of Olives? This is an urgent task." "And behold," writes Fr. Antonin, "105 people (two-thirds of them women) arrived in haste at Jaffa on Tuesday and set about the work. Thanks to the general enthusiasm, and despite a thousand difficulties, seven days later the bell successfully arrived (by hand!) at our tower. On February 5, in the evening, it was solemnly met, rousing the entire city. Then hordes of pilgrims arrived, out of nowhere, as it were, to drag the bell to Holy Olivet, to the place appointed for it." The magnificent bell-tower of the Russian Church of the Ascension on the Mount of Olives, known as the "Russian candle," is now visible from all vantage points in the area of Jerusalem. From its pinnacle one can clearly discern the Dead Sea and the region beyond the Jordan River; and with the aid of binoculars, on a clear day one can even see the Mediterranean Sea. Its largest bell is audible for miles, loudly bearing witness before the heter­odox to the successes of the Russian activity in Palestine, and causing incomparable spiritual delight for the Russian Orthodox people. Fr. Antonin had a particular fondness for the deep, dense ring. Finally, despite all the difficulties, on June 7,1886 (O.S. ), the solemn consecration of the church and bell-tower took place. Even Patriarch Nicodemus—this time, at least, well-disposed—attended. He delivered a panegyric sermon in honor of Fr. Antonin, the builder of the church, and his closest assistant in the great task, Hieromonk Parthenius, and even bestowed a pectoral cross upon the latter. Archimandrite Antonin (secular name: Andrew Kapustin) was born on 12 August 1817, into a family of long-standing priestly lineage, in the village of Baturino, in the Shardinsk District of the Province of Perm. After a primary education received at home, Andrew attended the district theology school. The generations which passed through such schools and seminaries received a classical education such as secular schools were never able to provide. Fr. Antonin, thanks to this schooling and his further training in seminary and theological academy, mastered the Greek, Latin, and Hebrew languages, and had a working knowledge of Tartar. In the Levant, he learned Modern Greek well and spoke it fluently, and even added two more languages to his repertoire—French and German. It is not possible at this far remove to say whether he knew Turkish and Arabic well; but, living in the Levant, as he did, for thirty years, it is probable. Later, Fr. Antonin graduated from the Kiev Theological Academy and taught there. In 1850, his ministerial career took a radically different direction: he was appointed rector of the embassy church in Athens, where he remained for ten full years. This was the period of his first great discoveries in the area of Byzantine archeology. He rebuilt the ancient Athenian 'Lykodemos' Church on the ruins of the ancient church (this subsequently became the embassy church), finding in it interesting ancient Christian burial inscriptions. These he published in 1874. The five subsequent years (1860-1865), Fr. Antonin spent as rector of the Russian embassy church in Constantinople, which also widened his knowledge and intro­duced him to a new circle of acquaintance with influential Russians and Greeks in the Near East. Finally, in 1865, Fr. Antonin was appointed to Jerusalem and became head of the Mission, or the "pilgrimage organization" as they used to call it. Its task was to care for and feed the huge number of Russian pilgrims in the Holy Land who, every year, right up to World War I, arrived in the tens of thou­sands. When Fr. Antonin arrived in Palestine, the only building standing was the Cathedral of the Holy Trinity, which stood in the middle of the then-recently-begun "Russian Compound"—intended as lodging for pilgrims. It was then that Fr. Antonin conceived the idea of buying parcels of land and building Russian churches on them, where Russian pilgrims could pray in their native tongue. Hospices were also needed, and in great numbers. But troubles began to arise. Palestine was then under the Turkish rule, and, since foreigners were prohibited from buying land, such purchases could be made only in the name of absentee owners who were Turkish citizens. Fr. Antonin acquired land in the name of his faithful assis­tant, J. E. Halebi, the Mission's dragoman. "Jakob Egorovich has adorned my whole life," Fr. Antonin said of him. Often there was no money, because the Russian government did not provide Fr. Antonin with any funds for purchases. He had to rely on donations elicited from the pilgrims. Only the energy and determi­nation of Fr. Antonin brought to completion the work that to this day astonishes everyone who visits the Holy Land. During the twenty-nine years of his activity, Fr. Antonin purchased thirteen parcels of land, covering a total area of over 105 acres, which became the property of the Mission, confirmed by deeds of ownership (kushans and senet-tugrals). The cost of these parcels of land, according to Fr. Antonin's account to the Most Holy Synod at the time of his death in 1894, was approximately one million rubles. In point of fact, he was personally responsible for the acquisition of almost all the Russian property in the Holy Land: Gomei, Gethsemane, the caves of the prophets, the oak of Mamre, the gardens in Jericho, and the area around the grave of St. Tabitha, including her actual tomb. His never-flagging energy aston­ished his contemporaries. Fr. Antonin with pilgrims, in the last years of his life. This is how Prof. A. A. Dmitrievsky describes a typical day in the life of Fr. Antonin: "The door of his cell stands open from early morning until late in the evening. Early in the morning he receives native Arabs, resolving their disputes, offering sage advice, providing them with material assistance in the form of neces­sities and money; next come the teachers of the schools founded by him, and members of the Mission, asking his counsel and decisions. And at all hours, the Russian pilgrims approach him freely and trustingly: officials, merchants, and peasants, rich and poor alike, in the hope of finding in him a resolution of the questions that trouble them. And Fr. Antonin gladly converses with each at length, and thus has managed to win many over to his side and make them active proponents of the work to which he has given his whole soul. Only late in the evening does he find himself alone, though not entirely alone: his friends are his beloved books. From late evening to late at night he sits poring over some old manuscript or folio, at times conducting important archeological research, at times carrying on a correspondence with newspapers or private individuals; then, armed with a magnifying glass, and having at hand the best numismatic publi­cations, he will bring all of his ocular power to bear on some ancient passage in an old manuscript or device on a Greek coin (Fr. Antonin was an avid coin-collector); then, withdrawing to the observatory he had installed on the roof of the Mission, he will spend some time studying the wondrous firmament of the sky with its diversity of luminaries. Then he will sit over his own chronicle, recording his thoughts, feelings, ideas, and impressions of the past workday, thus leaving the future historian of our time priceless material for reference; then, finally, equipped with a needle, he will mend his old riassa or hole-riddled stockings The noise of the samovar on the table, and tea, the 'favorite drink of his faraway homeland,' are constantly present in his office during his evening work… After such a day, often very early in the morning, he can be seen returning from the Russian building projects in the company of his faithful dragoman, Jakob Halebi, having 'made the tour of his diocese,' as those inclined to humor put it, having in mind the building proj­ects underway at the Beth-Jal hostel, or the hospices in Hebron, Gomei, Jericho, and other places." It ought also to be mentioned that, despite all of his activity, Fr. Antonin unfailingly read the daily services prescribed by the monastic rule. When did he sleep? "All of his contemporaries and colleagues who remain alive speak of Fr. Antonin's modesty and unpretentiousness," writes Archimandrite Cyprian (Kem). "His old garments; his extremely plain meals, often consisting of a single plate of the large black beans beloved of the Arabs, and sustenance never augmented by the meat customary among and favored by the monastics of the Levant, characterized the usual fare of the chief of the Mission. He was not afraid of demeaning the prestige and dignity of his official position by his modest life and labor. 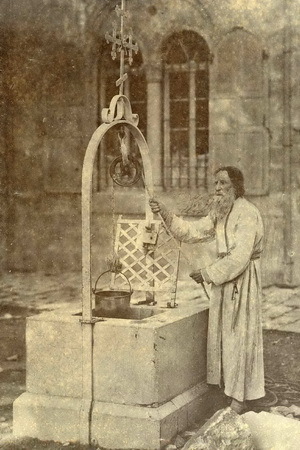 More than once, people unacquainted with him, finding him cleaning his own cell and taking him for the attendant, would ask him to inform the Archimandrite of their arrival, and shortly thereafter would be astonished and embarrassed when the selfsame 'cell attendant' appeared before them in an ample Greek-style riassa, in the person of the chief of the Mission." Thus did the ever-memorable Fr. Archimandrite live in the Holy Land for twenty-nine years, laboring day after day without rest. Fr. Parthenius (whose secular name was Parmenius Timofeyevich Nartsissov) was the son of the preceptor of the village of Zagradchina, in the Rannenburg district of the province of Riazan. Because of his poverty, he completed only three grades of church school. Thereafter, he assisted his father on the cliros. At the age of fifteen, he became a novice in the Dankov Monastery. In 1879, at the age of forty-eight, having already been ordained to the rank of hieromonk, he visited the Holy Land as a pilgrim. "There," writes Prof. Dmitrievsky, "he became close with Fr. Antonin Kapustin, the chief of the Russian Ecclesiastical Mission, on whom Fr. Parthenius made a very favorable impression. At first, Archiman­drite Antonin appointed him to perform the daily services in the Cathedral of the Holy Trinity (in the Russian Compound). "In the time he had free from serving, Fr. Parthenius loved to spend whole days and even weeks on the Mount of Olives, living in a little room at the hospice for pilgrims. He kept a careful watch over the con­struction then under way and the excavation of the ancient buildings and burial crypts. Finally, when the church was completed and consecrated in 1886, the divine services were permitted on Thursday and Sun­days, as well as on feast days. Fr. Parthenius became the only priest to perform the services, attracting Rus­sian pilgrims who knew the order of services and had good voices to participate in them. His services, which were full of reverent simplicity and total spiritual unity in prayer between pastor and his ever-changing flock, were assiduously and devoutly attended by the pilgrims, who loved the simple Fr. Parthen­ius fervently for his truly Russian hospitality on the Mount of Olives." Fr. Parthenius by one of his wells. After the consecration of the church and the bell-tower, Fr. Parthenius' care for the Russian Olivet not only did not cease, but increased. The indefatigable elder Fr. Parthenius labored continually in his chosen portion, excavating the necropolis (the ancient cemetery), clearing away the accumulated refuse, which had built up over the mosaic floors of the ancient temples and buildings. He made uneven areas and depres­sions level, installed cisterns for the collection of rainwater, and dug pits for the planting of trees. In his daily, tireless work, he tried to do everything with his own hands, trusting in the good health with which God had blessed him. At times he would carry soil on his own shoulders to fill in the uneven places and to pour around the trees he had planted, at times he would carry water in goat skins from far away, when there were still not enough cisterns on the Mount of Olives to furnish water for the saplings and flowers which he cultivated lovingly. All the present beauty, all the many stands of cypress, olive, and pine trees are the work of the tireless hands and sturdy shoulders of Fr. Parthenius. Moreover, one ought not to lose sight of the fact that Fr. Parthenius' enemies in this work were not only the stony, arid soil and burning sun, but the half-wild, thieving Moslem inhabitants of the neighboring villages, who, at the first available opportunity, under cover of night repeatedly removed stones from the boundary walls of dry masonry, uprooted his flowers and herbs, stole his seedlings, and even carried off his meager personal necessities. When day broke, the elder would survey with pain of soul the traces of his neighbors' depredations. He would com­plain bitterly about them to his occasional visitors, but would not annoy those who offended him, trying instead to live with them in peace and harmony, and continuing with redoubled energy to work on his beloved grounds. Anyone who visited Jerusalem and knew the late elder described him in the same way: slight of stature, thin, with kindly blue eyes, bright red, straggly hair, and a long, bushy beard, which turned gray in old age, taking on an ashen color. He was a very animated man and somewhat fussy, speaking the Great Russian language rapidly. His face was kindly and sympathetic. He invariably dressed in a simple motley cassock of the cheapest material. Fr. Parthenius' reputation grew among the pilgrims and inhabitants of Jerusalem; donations flowed in to him for the Mount of Olives church in abundance. At the same time, there also arose, of course, unfa­vorable rumors among wicked people concerning his personal, monetary resources. Actually, in his non-acquisitiveness, Fr. Parthenius owned practically nothing, for all the moneys received from well-wishers he spent on the church, the planting of trees, and the feeding of pilgrims. One ought also to mention that Fr. Parthenius was a great man of prayer. In the portion of the Olivet property furthest to the south, far from the buildings in which people lived, he dug out a cave with his own hands, where he often would spend a whole night keeping vigil. On 24 March 1894, Fr. Antonin reposed. Several years later, in 1903, Archimandrite Leonidas (Sentsov) became the chief of the Mission. He had travelled to Jerusalem as a student, had come to know Fr. Par­thenius, and supported his cherished desire to build a convent on the Mount of Olives. 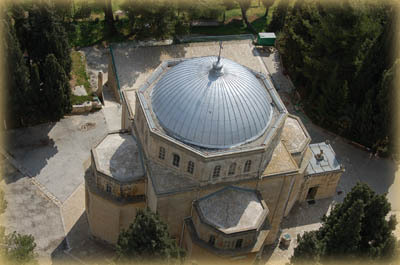 Arial view of the convent. Although the idea of founding a men's monastic community on the Mount of Olives belonged to Fr. Antonin, who had intended to found a monastery there, Fr. Leonidas rejected this idea, because in all the many years that had passed, there had been only one monk willing to live there: the monk Pambo, who served as watchman. It was his responsibility to let pilgrims in through the eastern gate when they came up to the Mount of Olives from Bethany, and to let them out through the western gate when they wished to go on to the "Russian Compound." For this reason, Fr. Leonidas decided to establish instead a women's con­vent on the Mount of Olives. In 1906, the Convent of the Mount of Olives was formally established by the Most Holy Synod. Fr. Par­thenius was appointed abbot. The nun Eupraxia, who had come to Jerusalem in 1880 from Moscow's St. Alexy Convent, was appointed superior (her secular name had been Maria Milovidova). On August 12, 1906, the birthday of Fr. Antonin Kapustin, the community was solemnly opened. It consisted originally of fif­teen sisters. By August of 1914 it had grown to 150. Later, almshouses, studios for iconographers and gold­smiths, and a refectory were built. Fr. Parthenius continued his labors of construction, excavation, and planting, by his unflagging energy inspiring all to take part in the work. On the night of January 14-15, 1909, his ascetic life was crowned with martyrdom. After the workday, Fr. Parthenius withdrew to his solitary home; but in the morning, he was found lying on the floor in a pool of blood, a deep wound in his neck. On the floor, the prints of bloody feet were visible; his possessions were in disarray, his drawers obviously rifled, as though someone had been searching for something. His murderers were never discovered, nor was their motive ever clarified. This venerable man, highly respected and beloved by all, his loss lamented not only by Russians but by foreign friends as well, was buried outside the Church of the Ascension, next to its northern wing, at the feet of his beloved elder, Fr. Antonin. "I am a novice of Fr. Antonin, and wish to lie at his feet," the ever-memorable Fr. Parthenius had said when he was alive. His desire was fulfilled. WARTIME, AND THE HISTORY OF THE WONDERWORKING ICON OF THE MOTHER OF GOD CALLED "THE MOUNT OF OLIVES 'SHE WHO IS QUICK TO HEAR'"
At the beginning of this century, shortly before World War I, a Russian-style icon was brought by pil­grims from Russia as a gift to the Mount of Olives Convent. It depicted the Mother of God and measured 50 by 36 inches. At first it was not placed in the main Church of the Ascension, but instead was put up in the altar of the yet-to-be-completed refectory church, dedicated to St. Philaret the Merciful. The sisters of the convent came to love the icon for its majestic, somewhat sad countenance, and often repaired to it when they said their prayers. From the outset of World War I, in which Russia battled Germany and Turkey, the Russian Ecclesiasti­cal Mission in Jerusalem (at that time under the rule of Turkey) was subjected to terrible persecution. All the clergy of the Mission and all the senior nuns were forcibly removed to Egypt. The Russian Compound and the Mission's gardens and properties in Palestine were occupied by Turkish soldiers. Monastic life on the Mount of Olives came to a halt. The nun Eupraxia, abbess of the Mount of Olives Convent, who had long been seriously ill, departed to the Lord during those disastrous times. The sisters—young nuns and novices—remained orphaned, bereft of all help, spiritual or material. Then their eyes fell upon the icon of the Queen of Heaven and they poured forth many tears in prayer before it. In March of 1915, a new misfortune befell the Mount of Olives and Jerusalem: a black cloud of locusts arose in the west and flew toward the east, beyond the Dead Sea. This was twice repeated. The first time, the locusts did not cause any great harm, but the plague in May was of wingless locusts. This infestation caused incalculable harm to the trees and fruits. "Millions of the creatures crawled along the ground, making a great din," wrote one of the sisters of the convent, "a clear and obvious punishment from God, the like of which none of us has ever witnessed before. Every day for a month we have struggled against the all-devouring locusts, beating and burning them." And times became even more difficult. Without warning, the Turkish military authorities demanded that all the nuns move out to make room for soldiers to be billeted there. The Greek patriarchate, in the person of Patriarch Damianos, offered the homeless sisters lodging in several Greek-owned buildings and unoccu­pied monasteries in Jerusalem. The nuns accepted this offer with gratitude, but, even though they moved to Jerusalem, they closely followed what was happening to their convent. When they learned from the Arabs of the neighboring village that the soldiers were looting and removing the convent's and their own personal property, they begged the Patriarch of Jerusalem to help them. His Beatitude the Patriarch hastened to inform the Sultan of what was happening in the Convent of the Mount of Olives, and soon the soldiers were removed on orders from the Turkish authorities, and the sisters were gradually allowed to return to their convent. Despite all material privations their spirits did not fall, for they had as their good helper the Queen of Heaven in her wondrous icon. For them, the holy icon had become "a haven and a consolation." Finally, in November of 1918, Jerusalem was captured by the British. British soldiers were also quartered on the Mount of Olives. They lived there for a month, but helped the sisters, providing them with bread, tea, and sugar. The new government provided the sisters with work constructing a road leading to Jericho. In January of 1919, the other nuns returned to the Mount of Olives from Alexandria, and in June, the church was opened for the first time since it had been sealed in 1914. Then the nuns brought the icon into the main church of the monastery and noticed that when it was installed in its new place, the face of the Mother of God shone as with light, and her garments and those of the Divine Infant had become bright and clear. With their meager funds and their own labors and fervor, the sisters provided a beautiful carved icono-stasis for the church, replete with gilded columns. Somewhat later, they fashioned golden crowns for the Mother of God and the Savior. A feast day was appointed for this image, viz., the 9th of November, the day on which the Athonite wonderworking icon of the Mother of God "She Who is Quick to Hear" is commemorated. The Church of the Savior's Acension today. Evacuated from a Russia taken over by an atheistic regime after the election of St. Tikhon, Patriarch of All Russia, Metropolitan Anthony (Khrapovitsky) arrived abroad and soon turned his attention to the state of the Russian Ecclesiastical Mission in Jerusalem where, since 1919, the British ruled under the mandate of the allies who had fought together against Germany. To clarify the situation, Metropolitan Anthony sent Archbishop Apollinarius. Bishop Apollinarius was greeted ecstatically by the members of the Russian Ecclesiastical Mission, headed by its acting chief, Archimandrite Meletius, and sisters from the two convents (those of the Mount of Olives and Gornei) which had recently undergone so many trials. Having regulated, to a degree, the internal life of the monastic communities, Bishop Apollinarius, how­ever, found that he was unable to secure any improvement with regard to the Mission's property holdings in the Holy Land, and he soon left Palestine. After this, Metropolitan Anthony himself undertook a journey to the Holy Land, in April of 1924. Thor­oughly investigating all aspects of the life of the monastics, both spiritual and material, Metropolitan Anthony poured a fresh, spiritually bracing stream into the souls of the sisters who had suffered so during wartime. He made an indelible impression on the entire Russian colony, which then consisted of some 400 souls in the Holy City. Having acquainted himself with the mood of the British government, headed by the High Commissioner, the Metropolitan returned to Serbia. But he soon dispatched Archbishop Anastassy of Kishinev and Khotinsk to Palestine. The archbishop, who had previously resided in Constantinople, came to strengthen the position of the Ecclesiastical Mission in Jerusalem, and asked Patriarch Damianos of Jerusalem for per­mission to remain as overseer of the Mission, even though he was an archbishop by rank. This was forth­coming. Beginning in 1924, Archbishop Anastassy undertook the duties assigned him by the Synod. The Mount of Olives community was renamed a convent, and the mother superior, Elizabeth, was elevated to the rank of abbess and given a staff of office. At that time, the construction of the church of the Mount of Olives was brought to a conclusion with the completion of the exonarthex, in the southern wall of which the stone was set, on which, according to tradition, the Mother of God had stood during the glorious Ascension of her Divine Son. This exonarthex was also necessary because the church could no longer hold the large number of sisters. By this time, their number had risen to about two hundred. During this period, yet another disaster struck the convent: in 1927 a powerful earthquake shook Jeru­salem and the surrounding area. The Mount of Olives sustained more damage than other places. The Church of the Ascension, the bell tower, the abbess' residence, and many of the buildings that housed the nuns were affected. Eyewitnesses say that, during the earthquake, the bell-tower swayed like a pendulum. Considerable labor was required to set matters aright, and Abbess Elizabeth of the Convent of the Mount of Olives, who after all of this fell seriously ill, considered herself incapable of carrying out this work. The appointment of a new abbess was essential, and the choice of Metropolitan Anthony fell upon the nun Paula (Kliucheva), of the Lesna Convent, whom His Beatitude knew personally. In October of 1929, Abbess Paula arrived at the Mount of Olives and assumed her duties. Her task was not an easy one. It was first necessary to return the convent to the path of the normal monastic life, which had been interrupted by the war years. The abject poverty of the Russian Ecclesiastical Mission, now cut off from Russia, forced the sisters to go out into the world to find jobs. Many found work as domestic servants, mostly in English households. The new abbess considered it essential to bring this to an end, and to call in all the sisters working in the world. She conceived the idea of re-establishing within the convent's walls workshops for the production of ecclesiastical articles: gold embroidery, mother-of-pearl crafts, and iconography. In this way, she hoped at the same time to give foreigners and the heterodox a correct understanding of the real purpose of Russian Orthodox convents, not only in the sense of struggle in prayer, but also in that of self-denying labor. A display was organized, and it produced so powerful an impression upon those who visited it that the governor of Jerusalem offered Abbess Paula the opportunity to organize another exhibition at his gubernatorial residence in the center of Jerusalem; the offer was accepted. Thereafter, the Convent of the Mount of Olives began to receive orders from far and wide for ecclesiastical handicrafts and icons. Their objective was achieved. In this way, the funds needed for the restoration of the convent buildings were obtained. But the health of Abbess Paula declined; she began to sicken. Sensing the approach of death, she requested tonsure to the Great Schema. Her request was granted, and she received the new name Antonia. Her successor, in 1934, was the nun Melania (Neniukova), who two years previously had arrived at the Mount of Olives Convent from Yugoslavia, on the recommendation of His Holiness, Patriarch Barnabas of Serbia, who knew her to be a wise nun, possessed of exalted spiritual qualities. In 1936 Metropolitan Anastassy left Palestine to assume from his predecessor Metropolitan Anthony the duties of the First Hierarch of the Russian Church Abroad. From 1937 and during fourteen years thereafter the Mission was headed by Archimandrite Antony (Sinkevich), the present Archbishop of Los Angeles and Southern California. The outset of World War II marked the beginning of many difficulties for the convent. 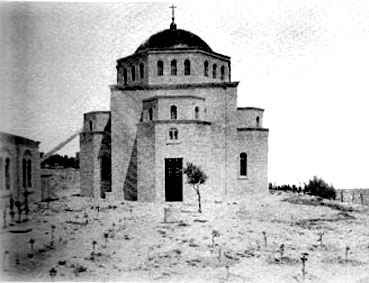 Nevertheless, in 1938 Abbess Melania undertook a major renovation of the Church of the Ascension, which had suffered considerable damage in the earthquake of 1927. It was completed only at the end of 1941. All the frescoes had to be removed; they were replaced with new ones painted by the nuns Thaisia, Zosima, and others, as well as some executed by the Russian artist G. A. Alexeyev. Weak of health and with an ailing heart, Abbess Melania reposed two years later (in 1944), and Schema-abbess Antonia was prevailed upon to return to her abbacy at the desire of the sisters and with the blessing of the bishops. After the conclusion of World War II, a difficult period again ensued for the Russian Ecclesiastical Mis­sion, and for the Mount of Olives Convent in particular. Patriarch Alexis arrived from Moscow <…>, and laid claim to the Russian property in the Holy Land. This could not fail to worry the convent. But he departed without obtaining what he desired. Then after the United Nations recognized the State of Israel, Palestine was divided. Israel turned over all the Russian properties on its territory to representatives of Moscow, and the first Arab-Israeli War began. The Russian Ecclesiastical Mission lost its residence building: the Russian Compound, with the Cathedral of the Holy Trinity, in the center of New Jerusalem. The Mount of Olives Convent filled up with sisters who fled from the Gornei Convent, which had found itself on territory assigned to Israel and was taken over by people from the Soviet Union. Economic tribulations began again. By his hard work—pleas and petitions for help to the Mission and its inhabitants, left destitute by developments in the Holy Land, Archimandrite Antony was able to raise substantial revenues from Russian people, primarily from America. In addition, the sisters received help (in the form of food) from the International Red Cross. In 1951 Archimandrite Demetrius (Biakai) was appointed chief of the Mission. At first he lived in the Gethsemane Convent, attached to the Church of St. Mary Magdalene; later he moved to the Mount of Olives, where he reposed in retirement on 8/21 August 1985. Thanks to his keen intellect, phenomenal memory, energy, and tact, the good relations essential for the normalization of the complex situation of the Russian Ecclesiastical Mission were established and the influx of pilgrims began once more. That same year, Schema-abbess Antonia again withdrew into retirement and was replaced by Abbess Tamara, the daughter of Grand Duke Constantine Constantinovich Romanov (the poet "K. R."). She governed the convent until 1975. During her tenure of office, the centennial of the Russian Ecclesiastical Mission in Jerusalem was celebrated in 1958, in the presence of a representative of King Hussein of Jordan. With her flock, she survived a terrible bombardment during the six-day war in 1967, during which the nun Eulalia, the convent doorkeeper, was killed. Abbess Tamara reposed on the feast of the Dormition of the Mother of God, 15/28 August 1979. In 1968, after the retirement of Archimandrite Demetrius, Archimandrite Anthony (Grabbe) was appointed chief of the Mission, a post he held until 1985. From 1975 to 1984, the Convent of the Mount of Olives was governed peacefully by Abbess Theodosia. Another, less extensive restoration of the Church of the Ascension was undertaken between 1977 and 1978, during which the wall frescoes were restored by the 80-year-old nun Thaisia, with the help of other sisters. This, in brief, is the history of this immense labor, which has been accomplished by the Russian faithful on the Mount of Olives. Eternal memory be to its founders, Archimandrite Antonin and Abbot Parthenius! 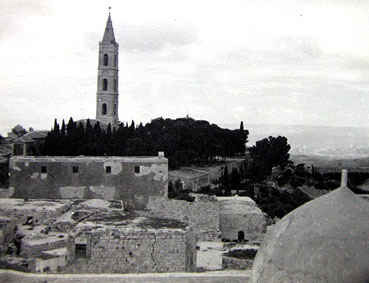 FromСвятой Елеонъ, The Mount of Olives Convent 1886–1986, (Jerusalem: Russian Ecclesiastical Mission in Jerusalem, 1986), 129–138. Posted on OrthoChristian.com with permission. Abbess Parasceva was succeeded by Abbess Juliana. Currently heading the convent is Abbess Moisseia, whose deputy is Mother Raphaela. The sisterhood is multi-national, including Russians, Palestinians, Romanians, and Estonians. Reposed July 18, 1996 (o.s.). —OC. Patriarch Alexis I (Simansky) (October 27, 1877 – April 17, 1970). —OC. At the time of this publication in 1986. There are currently 46. —OC.